My dad is a man with very specific tastes when it comes to food. I on the other hand am someone who will try just about anything and everything. Dad loves traditional Hungarian streudel and remembers his aunts stretching and pulling the dough across a long table in the kitchen. His favorites are the ones made with fruit as long as they are fruits that he recognizes. Unfortunately, I do not have the recipe for our family streudel. I, also, have a hard time visualizing myself doing the traditional ‘stretching and pulling’ of the dough. What I do know is how to combine fruits that Dad loves and turn them into a gorgeous crisp. 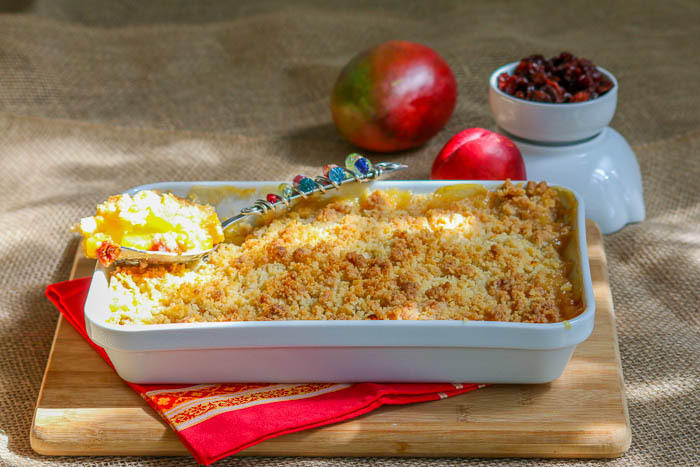 In this case it’s a Nectarine Mango Cherry Crisp. The nectarines have been glorious and mangoes seem to grow on every other tree in South Florida. As for the cherries, I opted for dried cherries because the cherries were not quite at their peak. However, this will change soon enough and I will then substitute fresh for dried for as long as the season allows. 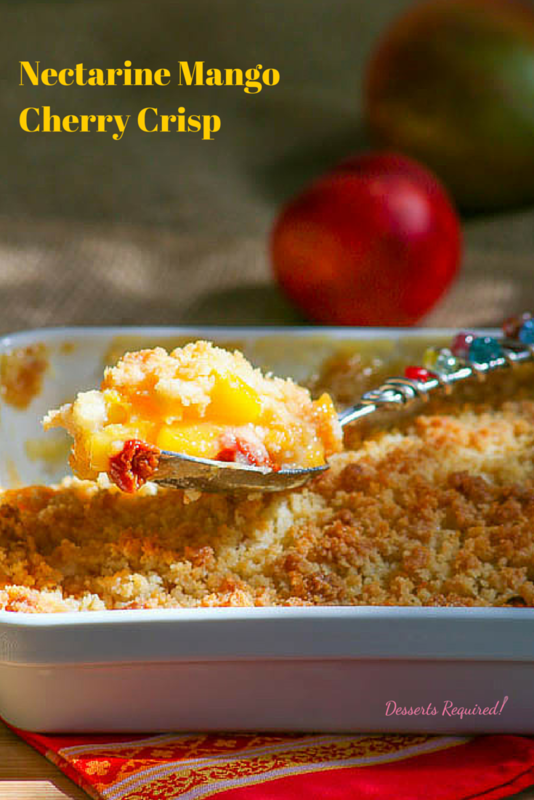 I fell in love with panko toppings when I made one for my Berry Peach Citrus Crisp. I made a lemon version to complement today’s fruits. Unfortunately for me, my dad is in Cleveland and I am in Florida. 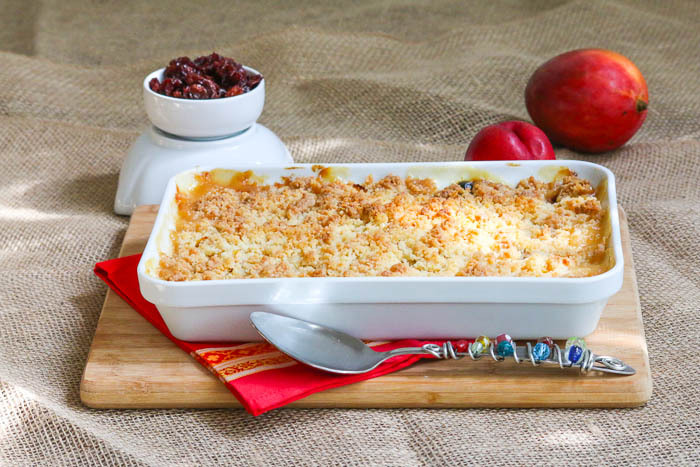 Maybe next year we will be in the same city to celebrate Father’s Day, because I would love to make him his very own Nectarine Mango Cherry Crisp. Happy Father’s Day to the dad in your life! What’s his favorite dessert? Will you be making it for him this year? Please leave me a comment and let me know. Preheat the oven to 350°. Set aside a 11" x 7½" baking dish. Peel the nectarines. Cut into medium size pieces and place into a bowl. Cut the mango into medium size pieces and place into a bowl. 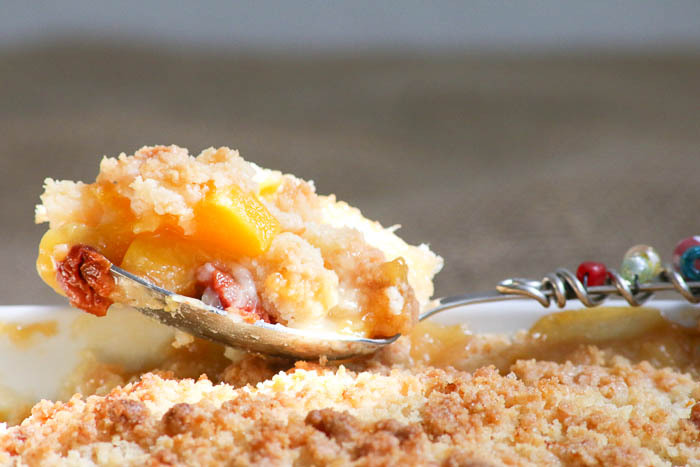 Toss the nectarines and mango with ½ cup sugar and ¼ cup flour. Stir in the cherries. Transfer the fruit to the baking dish and set aside. Place ½ cup sugar, ½ cup flour, panko crumbs, lemon zest and butter in a mixing bowl. Use your fingers to combine the ingredients just until they are mixed together but not blended. Cover the fruit with the crumb mixture. Do not blend it into the fruit. Place the baking pan onto a baking sheet. Bake at 350° for 1 hour. 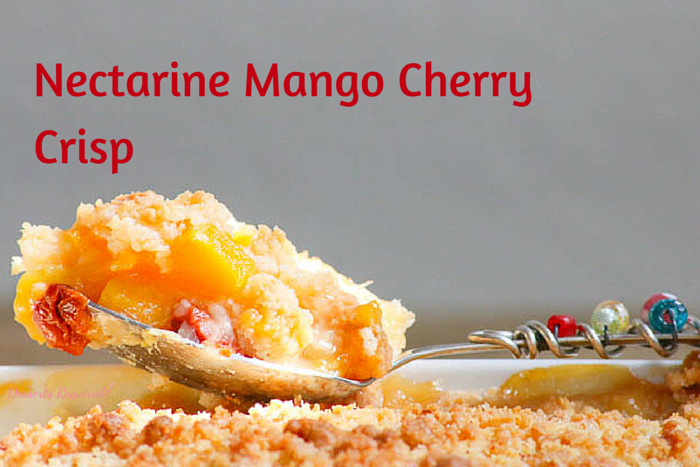 nectarine, mangos and cherries sound divine together in a crisp! It looks so crumbly and that topping is very intriguing. Panko on sweets is a new idea for me. This looks so good Betsy! I would love a slice of this and so would my family. Rolling up my sleeves! Thanks so much, Diane. I have fallen in LOVE with panko crumbs in desserts. You have to give it a try! What a nice combination of flavors and all the fruits are available right now. Delicious! I love summer fruits, Lydia, so the timing really is perfect! What a tasty flavor combination! I love them all!!! The panko breadcrumb topping is unique, and sounds very delicious! Thanks so much. Panko breadcrumbs add such a fabulous crispiness to the topping. I love making fruit crisps, this is a new combination for me and sounds wonderful, and I love the idea to use panko in the topping! Thank you, Sara. I greatly appreciate your feedback! I never would have thought of panko on a dessert! I love the combination of fruits in this dish. It sounds like something we would really love. Thanks so much, Michelle. It’s always fun to try something new! Panko topping is a great idea! What a delicious dessert. My dad would love this too! We weren’t together this year either, but I get to see my dad at least every month! You are so fortunate to get to see your dad every month. I see mine twice a year and that is simply not enough for my happiness! I love the fruit combination! This crisp must have been packed with flavors! It really was, Katerina. You have to try this!